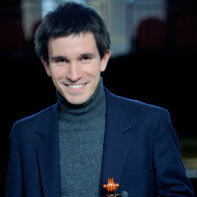 Simon Kodurand was born in Cardiff in 1980 and began playing the violin at the age of thirteen. He gave his concerto debut at the age of seventeen before going on to study at both the Royal College and Royal Academy of Music, where he was awarded a scholarship. Since leaving the Academy Simon has pursued a busy career on both the modern and baroque violin, playing and recording with a number of groups including The Avison Ensemble, La Serenissima, The Academy of Ancient Music, The Sixteen, The Kings Consort, The Royal Philharmonic Orchestra, Orchestra of St. Johns, English Symphony Orchestra, London Soloists Chamber Orchestra, and he is currently leader of The London Charity Orchestra. As a soloist and chamber musician Simon made his debut at the Purcell Room in 2004, recorded Schoenberg’s Verklarte Nacht with the RAM Soloists whilst at the Academy and has recently recorded concerti by Vivaldi and Valentini with La Serenissima.